Your pH electrode is the most sensitive component of your pH instrument. Correct calibration procedures combined with proper maintenance will provide years of reliable measurement. Since glass pH electrodes measure H+ (hydrogen ion) concentration relative to their reference half-cells, they must be calibrated periodically to ensure accurate, repeatable measurements. Our wide selection of commercial pH calibration buffer sachets include solutions that are standardized against NIST-certified pH references for calibrating meters with resolution up to 0.01pH. Although calibration against one pH reference buffer (one-point calibration) typically ensures accurate pH measurement, frequent two-point or even three-point calibrations ensure the most reliable results. Make sure your pH system includes calibration buffers for a range of pH values. Rinse electrodes with distilled water before and after measuring a sample. Blot the end of the electrode with lint-free paper to remove excess water. NOTE: Never wipe the electrode to remove excess water - wiping can create static charges that interfere with correct pH measurement. pH electrodes are shipped with the electrodes moist. Remove the protective cap or rubber boot from the bottom of the sensor and rinse the electrode with distilled or deionised water. Place the electrode in a clean container containing one of the liquids i.e. 4.0 M KCl or pH 4.0 buffer or pH 7.0 buffer. Soak electrode for 20 minutes. NOTE: Never condition the electrode in distilled water or deionised water - long term exposure to pure water will damage the special glass membrane. After conditioning the sensor, rinse the electrode with distilled or deionised water. The electrode is ready for calibration and measurement. Always keep pH electrode moist. Proper pH electrode storage maximizes electrode performance and extends electrode life. It is best to store electrodes in clean containers filled with pH storage solution, EC-RE005. Do not store an electrode in distilled or deionised water - this will cause ions to leach out of the glass bulb and render your electrode useless. After any of the cleaning procedures, thoroughly rinse the pH electrode with deionised water, drain and refill the reference chamber, and soak the electrode in storage solution for at least an hour. CAUTION: Proper eyewear and hand gloves must be used when handling strong chemicals. There are many different ways of measuring the pH of soil. Some use a saturated paste extract, others use a 1:5 dilution of soil: water, and then take a pH measurement on the resulting solution with a laboratory meter. Others use the 1:5 dilution, but instead of water they use a dilute Calcium Chloride (CaCl²) solution. 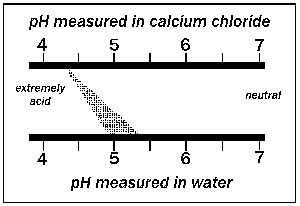 As a rough guide, the pH in CaCl² is usually 0.8 pH lower than in water, but can be as much as 2.0 pH units lower on grey sands. Ensure that you check the method used to measure you soil pH so that you are comparing similar methods. Make up a dilute CaCl² solution with distilled/deionised water to use as you need it. Ready made calcium chloride solutions often do not keep for very long, so buy CaCl² and make the solution yourself. The calcium chloride is usually the dehydrate form (water is attached to the crystals - it will have this written on the label of the container - CaCl².2H²O). Dissolve approximately 7.5g of the salt in 5 litres of distilled/deionised water. If you are using a form of calcium chloride crystals without any water attached (CaCl²), dissolve about 5.5g of the salt in 5 litres. There is no need to be very accurate in your weighing as small errors will not effect the results. Use the spoon to weigh out about 10g (to the nearest half gram), of your soil into the container. Add 50ml of distilled water to the soil. Any rough measurement ensuring a 1:5 diluted will suffice. Shake the container for about 2-3 minutes then allow the soil to settle for 2 minutes. If your soil has a high clay content and you require a very accurate result, it may not be necessary to filter the suspension. If filtering is note required, measure the pH value on the water above the soil in the container. Ensure you get a steady reading on the digital readout. Always wash your containers out before testing your next sample. The amount of various elements present in the soil depends on the nature of the soil and on its organic matter content since it is a source of several nutrient elements. Soil nutrients exist both as complex, insoluble compounds and as simple forms usually soluble in soil water and readily available to plants. The complex forms must be broken down through decomposition to the simpler and more available forms in order to benefit the plant. These available forms are summarized in Table A. The pH value is a measure of acidity or alkalinity. The effect of pH on availability of essential elements is shown below. Iron, manganese and zinc become less available as the pH is raised from 6.5 to 7.5 or 8.0. Molybdenum and phosphorus availability, on the other hand is affected in the opposite way, being greater at the higher pH levels. At very high pH values the bicarbonate ion (HCO3) may be present in sufficient quantities to interfere with the normal uptake of other ions and thus detrimental to optimum growth. When inorganic salts are placed in a dilute solution they dissociate into electrically charged units called ions. 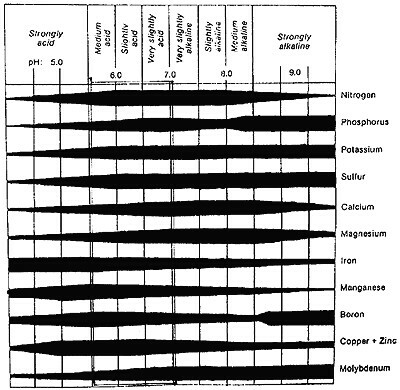 These ions are available to the plant from the surface of the soil colloids and from salts in the soil solution. The positively charged ions (cations) such as potassium (K+) and calcium (Ca2+) are mostly absorbed by the soil colloids, whereas the negatively charged ions (anions), such as chloride (Cl-) and sulphate (SO4-) are found in the soil solution. 1. Scoop up loose soil samples with a clean, dry plastic jar. Avoid touching the soil with your hands to prevent contaminating the sample. 2. Remove any stones and crush any clumps of soil to prevent breaking the delicate pHScan glass electrode bulb. 3. Fill up your sample soil up to 3/4 and add distilled water to the jar. Cap the jar tight and shake it vigorously a few times. Let the mixed sample stand for 5-10 minutes to dissolve the salts in the soil. 4. Prepare to log your test result in your data book for later reference. 5. Remove the caps of the jar and your pHScan. Dip the pHScan electrode into the wet soil slurry and turn the tester on. Take the reading when it stabilizes. 6. Press HOLD button to freeze the displayed pH measurement. Record the pH reading in your data book. 7. Press HOLD button again to release the reading. 8. Rinse your pHScan tester in clean water between each use. Calibrate the pHScan tester using the instruction provided in the packaging box. The pH test value in this procedure is accurate to ±0.5 pH or better (usually ±0.2 pH). The soil sample preparation and test procedure is adapted from accepted laboratory methods. Soil pH testing in the field gives small differences between tests. Using the 0.1 pH resolution pHScan 1 minimizes these differences. Most soil pH measurement cannot achieve ±0.1 pH accuracy, even with elaborate laboratory procedures and expensive pH instruments. Usually, soil pH data for many applications do not require testing for better accuracy than a few tenths of a pH or ±0.5 pH in some instances. pHScan 1 easily meets requirements for soil pH testing, and is very economical to use in places where many samples and tests are taken. Prepare and run at least three tests of the same soil sample to confirm results. Minor (< ±0.5 pH) or no differences between readings indicate good technique and high confidence in results. Larger differences (> ±0.5 pH) require more testing and consulting with the authorizes mentioned above. Compare your test results with secondary soil pH references available from these test authorities. Confirm good technique and accuracy of your test results with these agencies. While most prudent laboratories realise the importance of testing all Class A volumetric glassware on receipt and before use, it is surprising how few know the correct procedures for testing volumetric calibrations. An incorrect calibration, while only playing a small part in a study, can jeopardise the integrity of the studies finding. This is why major manufacturers of quality volumetric glassware recommend that all Class A glassware be checked before use. Unfortunately though, so few laboratories or text books contain the correct procedures for calibration of volumetrics. Everyone should know to take into account temperature variations on the water and glassware, but how many people take into account the different shrinkage rates between Borosilicate glass and Soda Lime glass. With Borosilicate's tighter molecular structure than Soda Lime glass it is less responsive to changes in temperature resulting in minimal thermal expansion which needs to be taken into consideration when testing calibrations. So how do I tell them apart I hear you ask. As a general rule Soda Lime glass is labelled in amber stain, while Borosilicate glass not being able to be stained successfully with conventional amber staining techniques, will be labelled in white or blue ink. Some brands such as Duran are a trade name for Borosilicate glass 3.3, so these will all be in Borosilicate. Calibration procedures are also influenced by air pressure and temperature at the time of reading, regardless of what type of glass you are testing. By measuring a barometer reading and calculating the air temperature the results may be used in an "Air Pressure And Temperature Correction Table" to obtain a correction figure which is taken into account to obtain a final gravity result to ensure a consistently accurate result is obtained. We strongly recommend that to comply with good laboratory practice, all Class A volumetric glassware should be check calibrated on receipt. If you consistently find that the glassware falls outside the Class A tolerances for accuracy or delivery time, it should be sent back to your supplier. For your convenience we at Bacto Laboratories Pty Ltd have collated all of the relevant procedures and tables from ISO Standards and British Standards with thanks to Volac Volumetric Glassware. Temperature is an important variable in manufacturing, quality control, and maintenance processes. Monitoring temperature insures that processes are operating consistently under optimum conditions which results in improved product quality, increased productivity, and reduced downtime. Infrared temperature measurement has been used successfully for years in research and manufacturing applications. Recent innovations, however, have dramatically lowered costs, increased accuracies, and reduced sensor size making this technology available to a new group of users and applications. What is Infrared Temperature Measurement? The infrared spectral range is an invisible portion of the electromagnetic spectrum extending from 0.7 to 1000 microns. Any object warmer than absolute zero (0 Kelvin) emits energy somewhere within this range. Infrared energy is also transmitted through objects from another source and reflected off the surface of an object. Infrared thermometers sense emitted, reflected, and transmitted energy from an object and translate this information into a temperature reading. In essence, energy passes through the unit's optical system and is converted to an electrical signal at the detector. The signal is displayed or converted to a standard output (°F or °C). emissivity and distance-to-spot size ratio. Emissivity is the ratio of radiation emitted by a surface to the radiation emitted by a perfect black body at the same temperature. It is also described as an object's ability to emit or absorb infrared radiation. A perfect black body neither reflects nor transmits energy and has an emissivity of 1.0. Infrared thermometers are available with fixed and adjustable emissivity. Most organic materials and painted or oxidized surfaces have and emissivity of 0.95; thus most units with fixed emissivity are preset at 0.95. Please see the following table for common emissivities. 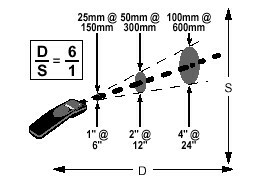 Distance-to-spot size ratio is the relationship between the distance of the measuring device from the surface and the portion of the surface being measured. This ratio varies from unit to unit. The following example applies to a unit with a distance-to-spot size ratio of 6:1. Industrial/Electrical: Monitor steam systems, boiler operations, and motor/engine cooling systems performance; detect hot spots in electrical systems, panels and motor bearings. Widely used in all types of industries such as food, veterinary, paper, rubber, textiles, glass, plastics, metals, gas/electric utilities, cement, tires, pharmaceutical, asphalt, roofing, electronics, carpet/floor covering, and many more. Heating and air conditioning: Monitor furnace and duct leakage; detect insulation breakdown; check ceilings, walls and floors for proper room temperature, heat loss and gain. Food safety: Fast and convenient screening tool for both cold and hot foods for Food Safety and HACCP. No contamination or damage to the product. Easily take temperature of products moving on conveyors or hard to reach places. Verify equipment performance sanitation and process temperature conditions. Scan cooling systems, refrigerated display cases, trucks and storage areas before loading or stacking. Educational: Non-laser models are economical and safe for student use. Agriculture: Monitor plant temperatures for stress, monitor animal bedding to detect spoiling. Fire Safety: To detect hot spots in walls, floors, etc. after fire is extinguished. Infrared temperature measurement does have limitations and these should be considered before suggesting an IR thermometer for use in a given application. IR measurement is affected by an object's emissivity. Most organic materials and painted surfaces have an emissivity of 0.95 (the standard pre-set in fixed emissivity units). Inaccurate readings result, however, when measuring shiny or polished metal surfaces. To compensate, the area being measured can be covered with masking tape or flat black paint. After the temperature of the tape or paint has come to an equilibrium with that of the surface, the area can be accurately measured. An IR thermometer with adjustable emissivity may also be employed. It is also important to remember that the target area diameter increases proportionally as the distance from the thermometer to the surface increases (distance-to-spot size ratio). The unit is taking an average temperature of the target area and a larger area may result in less accurate measurements if temperatures vary across a given surface.